Paddy Bullard has recently published an article about Voltaire, Jonathan Swift and the querelle des anciens et des modernes on the blog of the Voltaire Foundation, Oxford. The piece is here. 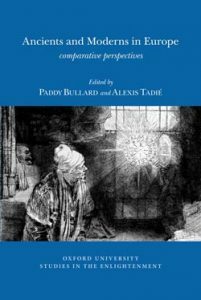 The posting marks the publication of a new collection of essays co-edited by Paddy and Alexis Tadié, Ancients and Moderns in Europe: Comparative Perspectives. The collection presents a new intellectual history of the ‘Ancients and Moderns’ dispute, in which fourteen contributors explore its manifestations across Europe in the arts and sciences, from the sixteenth to the eighteenth centuries. This entry was posted in Department of English Literature news and events and tagged Alexis Tadie, Department of English, Department of English Literature, Dr Paddy Bullard, English Department, English Literature, Reading, University of Reading. Bookmark the permalink.